Note: This page uses SAS 9.2. The tobit model, also called a censored regression model, is designed to estimate linear relationships between variables when there is either left- or right-censoring in the dependent variable (also known as censoring from below and above, respectively). Censoring from above takes place when cases with a value at or above some threshold, all take on the value of that threshold, so that the true value might be equal to the threshold, but it might also be higher. In the case of censoring from below, values those that fall at or below some threshold are censored. Please note: The purpose of this page is to show how to use various data analysis commands. It does not cover all aspects of the research process which researchers are expected to do. In particular, it does not cover data cleaning and checking, verification of assumptions, model diagnostics and potential follow-up analyses. In the 1980s there was a federal law restricting speedometer readings to no more than 85 mph. So if you wanted to try and predict a vehicle’s top-speed from a combination of horse-power and engine size, you would get a reading no higher than 85, regardless of how fast the vehicle was really traveling. This is a classic case of right-censoring (censoring from above) of the data. The only thing we are certain of is that those vehicles were traveling at least 85 mph. Example 2. A research project is studying the level of lead in home drinking water as a function of the age of a house and family income. The water testing kit cannot detect lead concentrations below 5 parts per billion (ppb). The EPA considers levels above 15 ppb to be dangerous. These data are an example of left-censoring (censoring from below). Example 3. Consider the situation in which we have a measure of academic aptitude (scaled 200-800) which we want to model using reading and math test scores, as well as, the type of program the student is enrolled in (academic, general, or vocational). The problem here is that students who answer all questions on the academic aptitude test correctly receive a score of 800, even though it is likely that these students are not “truly” equal in aptitude. The same is true of students who answer all of the questions incorrectly. All such students would have a score of 200, although they may not all be of equal aptitude. Let’s pursue Example 3 from above. We have a hypothetical data file, tobit.sas7bdat with 200 observations with format defined below. The academic aptitude variable is apt, the reading and math test scores are read and math respectively. The variable prog is the type of program the student is in, it is a categorical (nominal) variable that takes on three values, academic (prog = 1), general (prog = 2), and vocational (prog = 3). Variable prog comes with a format provided below. Let’s look at the data. Note that in this dataset, the lowest value of apt is 352. Note that no students received a score of 200 (i.e., the lowest score possible), meaning that even though censoring from below was possible, it does not occur in the dataset. 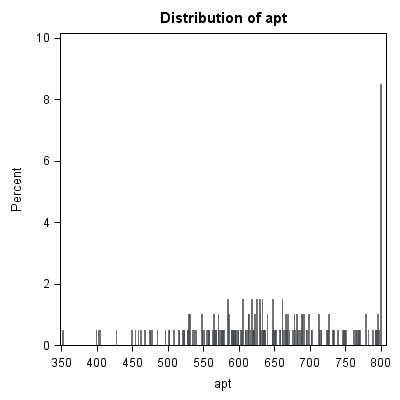 Looking at the above histogram showing the distribution of apt, we can see the censoring in the data, that is, there are far more cases with scores of 775 to 800 (i.e., the final bin) than one would expect looking at the rest of the distribution. Below is an alternative histogram that further highlights the excess of cases where apt=800. 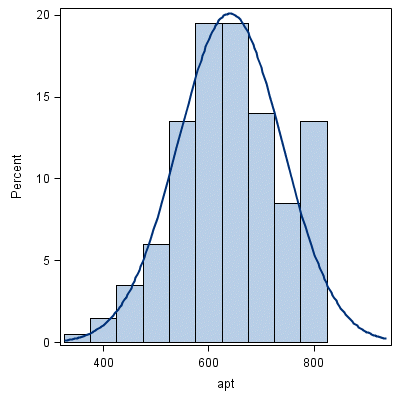 In the histogram below, midpoints option is used to produce a histogram where each unique value of apt has its own bar by specifying that there should be bins from 350 (the minimum of apt is 352) and a max of 800 in units of 1. Because apt is continuous, most values of apt are unique in the dataset, although close to the center of the distribution there are a few values of apt that have two or three cases. The spike on the far right of the histogram is the bar for cases where apt=800, the height of this bar relative to all the others clearly shows the excess number of cases with this value. Next we’ll explore the bivariate relationships in our dataset. 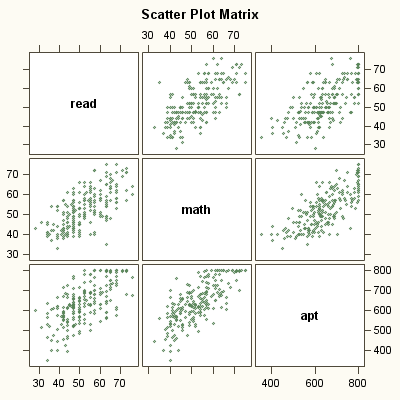 We make use of the scatter matrix plot created by proc corr via ods graphics on option. Note the collection of cases at the top of the bottom row of the scatter plots are due to the censoring in the distribution of apt. Tobit regression, the focus of this page. OLS Regression – You could analyze these data using OLS regression. OLS regression will treat the 800 as the actual values and not as the upper limit of the top academic aptitude. A limitation of this approach is that when the variable is censored, OLS provides inconsistent estimates of the parameters, meaning that the coefficients from the analysis will not necessarily approach the "true" population parameters as the sample size increases. See Long (1997, chapter 7) for a more detailed discussion of the problems using OLS regression with censored data. Truncated Regression – There is sometimes confusion about the difference between truncated data and censored data. With censored variables, all of the observations are in the dataset, but we don’t know the "true" values of some of them. With truncation some of the observations are not included in the analysis because of the value of the variable. When a variable is censored, regression models for truncated data provide inconsistent estimates of the parameters. See Long (1997, chapter 7) for a more detailed discussion of problems of using regression models for truncated data to analyze censored data. Below we use proc qlim to fit a tobit regression model. Note that proc qlim is part of the ETS module for SAS. It is also possible to fit a tobit model using proc lifereg (part of the STAT module), although the syntax to do so is somewhat different from the example shown below. The class statement identifies prog as a categorical variable, and the model statement specifies that apt should be modeled using read, math, and prog. The endogenous statement specifies that the outcome variable apt is censored, with an upper bound of 800 (i.e., ub=800). The top of the output provides a summary of the number of left- and right-censored values. The section labeled Model Fit Summary includes information on the number of observations (200), the number of iterations it took the model to converge, the final log likelihood, and the AIC and Schwarz Criterion (also known as the BIC). The final log likelihood of -1041 can be used to compare nested models, but we won't show an example of that here. The AIC and Schwarz Criterion can be used to compare nested and non-nested models. prog        vocational    0              0              .       .       . Under the heading Parameter Estimates we see the coefficients, their standard errors, the t-statistics, and associated p-values. The coefficients for read and math are statistically significant, as are the terms for prog="academic" and prog="general" (with prog="vocational" as the reference category). Tobit regression coefficients are interpreted in the similiar manner to OLS regression coefficients; however, the linear effect is on the uncensored latent variable, not the observed outcome. See McDonald and Moffitt, (1980) for more details. A one unit increase in read is associated with a 2.7 point increase in the predicted value of apt. A one unit increase in math is associated with a 5.9 point increase in the predicted value of apt. The terms for prog have a slightly different interpretation. The predicted value of apt is 46.14 higher for students in an academic program (prog="academic") than for students in a vocational program (prog="vocational"). The predicted value of apt is 33.43 points higher for students in a general program (prog="general") than for students in a vocational program (prog="vocational"). The ancillary statistic _sigma is equivalent to the square root of the residual variance in OLS regression. The value of 65.67 can be compared to the standard deviation of academic aptitude which was 99.21, a substantial reduction. That _sigma is statistically significant means that the estimated coefficient (65.67) is statistically significantly different from 0. The validity of this test of _sigma is a matter of debate among statisticians, and some programs will produce the estimate and standard error, but not the test of statistical significance. We can include a test of the overall effect of prog, by testing whether the coefficients for prog="academic" and prog="general" are simultaneously equal to 0. To do this we add a test statement to the proc qlim code. To figure out how SAS names the dummy variables for a class variable, it is usually a good idea to output the parameter estimates as a data set (in this example, we named it as t) and print it out to see how internally SAS names these variables. In our example, we see that SAS has appended the value label to prog in naming the dummy variables for prog. Because the model is the same, the output for this syntax is the same as before, except for the addition section shown showing the results of the test statement. Under Test Results, we see that the overall effect of prog is statistically significant. We can also test additional hypotheses about the differences in the coefficients for different levels of prog. Below we test that the coefficient for prog="academic" is equal to the coefficient for prog="general". We may also wish to evaluate how well our model fits. This can be particularly useful when comparing competing models. One method of assessing model fit is to compare the predicted values based on the tobit model to the observed values in the dataset. Below we use proc qlim to generate predicted values along with the data via the output statement. Then proc corr is used to estimate the correlation between the predicted and observed values of apt. The output from proc corr gives the correlation between the predicted and observed values of apt, which is 0.78094. If we square this value, we get the squared multiple correlation, this indicates that the predicted values share about 61% (0.78094^2 = .6099) of their variance with the observed values of apt. Long, J. S. and Freese, J. 2006. Regression Models for Categorical and Limited Dependent Variables Using Stata. Second Edition . College Station, TX: Stata Press. McDonald, J. F. and Moffitt, R. A. 1980. The Uses of Tobit Analysis. The Review of Economics and Statistics Vol 62(2): 318-321. Tobin, J. 1958. Estimation of relationships for limited dependent variables. Econometrica 26: 24-36. The sas program used for this page can be downloaded following the link. A translation of this page into Romanian by Alexander Ovsov is available here.